Being in nature, or even having a view of it, can help soothe the soul and make us feel calmer. No wonder architects are increasingly designing buildings that incorporate all manner of plants, grasses and other kinds of greenery, with an increasing number of extraordinary designs popping up in cities around the world. The latest to break ground is in Singapore, with the 280-meter-tall skyscraper set to become one of the highest buildings in the small city-state, reports Digital Trends. The building, expected to open in 2021, will blend urban life with tropical nature and feature office space, residences and retail sites. 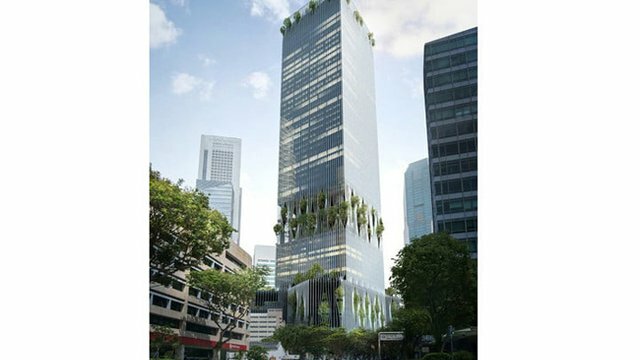 Once complete, green vegetation will seemingly sprout from the exterior of the building, “allowing glimpses into the green oases blooming from the base, core and rooftop,” the designer says. Those technologies include sensors for automatic control of the environment, as well as Internet of Things and artificial intelligence capabilities so tenants can customize their experience of the building.